Launching a new model in your car showroom ? 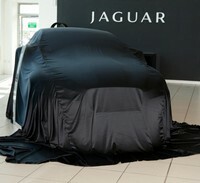 This is the silky draped cover that is whipped off to reveal your gleaming new model in all its glory ! Made from dense, non-transparent silky polyester satin material to drape over the car and heighten excitement, it will cover standard and executive sized saloons completely. The standard cover will cover a 4x4 though not drape onto the ground. Available in black or silver from stock as a standard size. Many other colours to order. Depending on the size of the vehicle the cover may drape on the floor but this is entirely normal. Custom made reveal covers are available to order, with or without logo, by phone or e-mail only. For 4x4 reveal covers see separate item. Silk Reveal Covers are not supplied with a logo as standard - talk to us about your logo requirements. We can do anything ! Mark, I received the reveal covers... awesome! Thanks from across the pond! Chicago, IL USA! "Spot on much appreciated , if only all other online retailers were as good as you."